Tourism in India should be developed in such a way that it accommodates and entertains visitors in a way that is minimally intrusive or destructive to the environment and sustains and supports the native cultures in the locations it is operation in. Moreover, since tourism is a multi-dimensional activity, and basically a service industry, it would be necessary that all wings of the Central and State governments, private sector and voluntary organizations become active partners in the Endeavour to attain sustainable growth in tourism if India is to become a world player in the tourism industry. The study is based on the secondary data and the main objective of this study is to study the Indian government policies and programmes of CSR and to analyze the corporate social responsibility (CSR) activities undertaken by the tourism industry. India is the first country in the world which made CSR compulsory for business houses as per Companies Act -2013. In the Indian economy for promoting the community development, the corporate sector in India has to share responsibility with government. 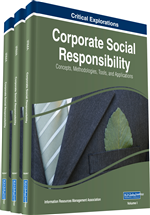 A term Corporate Social Responsibility (CSR) is widely used for defining the responsibilities of corporate world towards the society & environment. It is felt by the growing number of corporate that CSR is important for protecting the goodwill and reputation, defending attacks and increasing business competitiveness which cannot be considered as indirect expenses. Corporate initiative to assess and take responsibility for the company's effects on the environment and impact on social welfare corporate increasingly join hands with non-governmental organizations (NGOs) and use their expertise in devising programs which address wider social problems. We are aware that in a community, the Companies have a lot of power. At the level of national economy some companies may engage in “green washing”, but many large corporations are devoting real time and money to environmental sustainability programs, alternative energy/clean tech, and various social welfare initiatives to benefit employees, customers, and the community at large. In this connection we can say that The Ministry of Corporate Affairs has notified Section 135 and Schedule VII of the Companies Act 2013 as well as the provisions of the Companies (Corporate Social Responsibility Policy) Rules, 2014 to come into effect from April 1, 2014.With effect from April 1, 2014, every company, private limited or public limited, which either has a net worth of Rs 500 crore or a turnover of Rs 1,000 crore or net profit of Rs 5 crore, needs to spend at least 2% of its average net profit for the immediately preceding three financial years on corporate social responsibility activities. The CSR activities should not be undertaken in the normal course of business and must be with respect to any of the activities mentioned in Schedule VII of the 2013 Act. The CSR Rules appear to widen the ambit for compliance obligations to include the holding and subsidiary companies as well as foreign companies whose branches or project offices in India fulfill the specified criteria. The activities that can be undertaken by a company to fulfill its CSR obligations include eradicating hunger, poverty and malnutrition, promoting preventive healthcare, promoting education and promoting gender equality, setting up homes for women, orphans and the senior citizens, measures for reducing inequalities faced by socially and economically backward groups, ensuring environmental sustainability and ecological balance, animal welfare, protection of national heritage and art and culture, measures for the benefit of armed forces veterans, war widows and their dependents, training to promote rural, nationally recognized, Olympic sports, contribution to the prime minister's national relief fund or any other fund set up by the Central Government for socio economic development and relief and welfare of SC, ST, OBCs, minorities and women, contributions or funds provided to technology incubators located within academic institutions approved by the Central Government and rural development projects. Further the Companies can also collaborate with each other for jointly undertaking CSR activities; provided that each of the companies are able individually report on such projects.